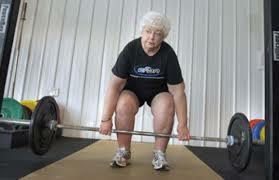 Hershey Orthopedic & Spine Rehabilitation: Think You're Too Old to Weight Train? Think Again. Think You're Too Old to Weight Train? Think Again. A recently published Wall Street Journal article says that a growing number of adults in later life are taking up strength training, but advises readers to consult with experts beforehand. The March 15 article asserts that "while old-school wisdom held that older adults were too frail to pump iron, a growing body of research is showing that strength training helps stave off age-related disability, preserve bone mass in women, and even boost brainpower." The article relates the stories of 3 individuals who found relief through strength training: a 54-year-old man whose strength training regimen eased pain from a childhood back injury, a 75-year-old woman who participates in special exercise classes that have helped reduce arthritis pain, and a 75-year-old man who was able to regain his ability to walk without back pain after training for 6 months. APTA has long supported strength training for older adults, and even included under-dosed strength training in its list of "5 Things Physical Therapists and Patients Should Question" released as part of the American Board of Internal Medicine Foundation's "Choosing Wisely" campaign. The APTA recommendation advises "Don’t prescribe under-dosed strength training programs for older adults. Instead, match the frequency, intensity, and duration of exercise to the individual’s abilities and goals." Training experts and researchers interviewed for the story advised that individuals with preexisting injuries—a common condition for older adults—should consult with professionals who can monitor and adjust exercises. The benefits go beyond the ways in which strength training can address pain and mobility, according to the article, which cites studies claiming that this type of exercise can serve as a complement to aerobic training to help keep brains sharp. Whereas cardio exercise can help strengthen the brain's ability in memory tasks, the article states, strength training has been found to help with higher-level brain functions that allow an individual to juggle multiple tasks.